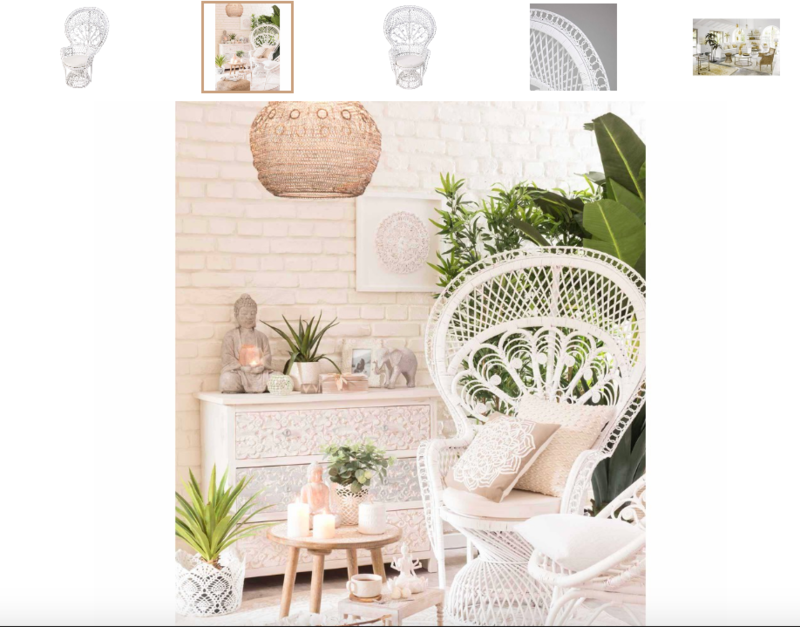 One of the things I love to do is decorating, redecorating, making a place cozy and pretty. 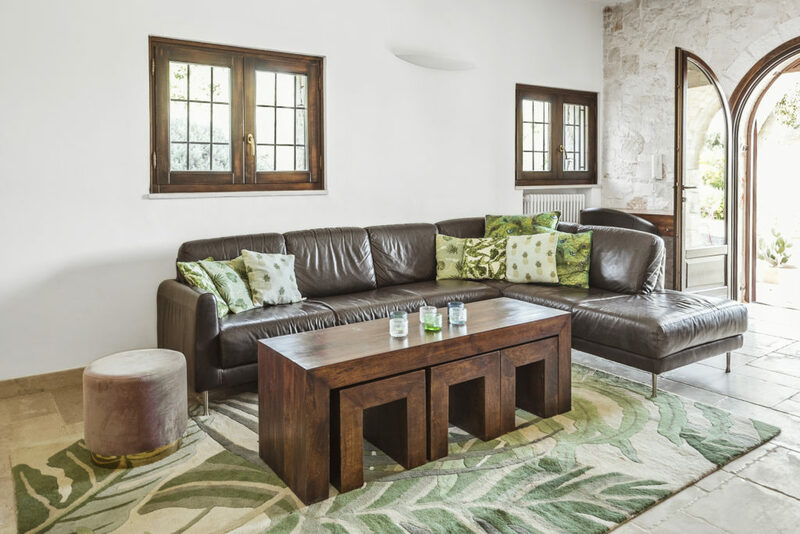 At Casa Vita we started with a fully furnished house, mostly by Ikea. 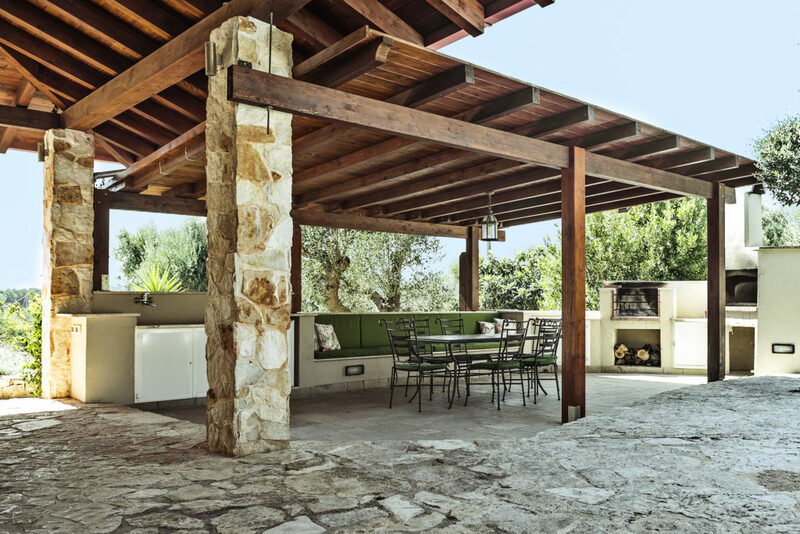 The former owners were great in reshaping and rebuilding the two old trullis and in making a beautiful yard. But I guess for the interior of the house, they preferred the simplicity of Ikea. Could be a practical side to it too, renting out a house brings along a big risk of damage. We rent the house out as well. 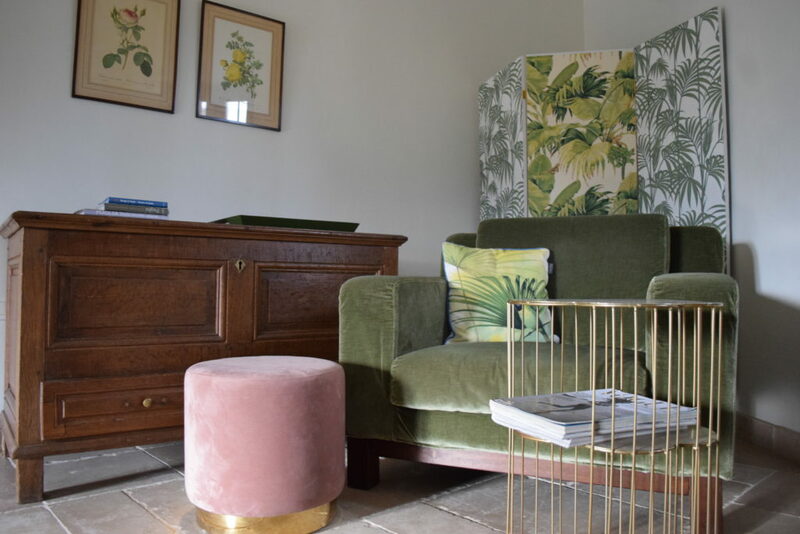 But if we stay at Casa Vita, we don’t want to live in an Ikea showroom 🙂 And so far, our guests have appreciated a more personal approach too. 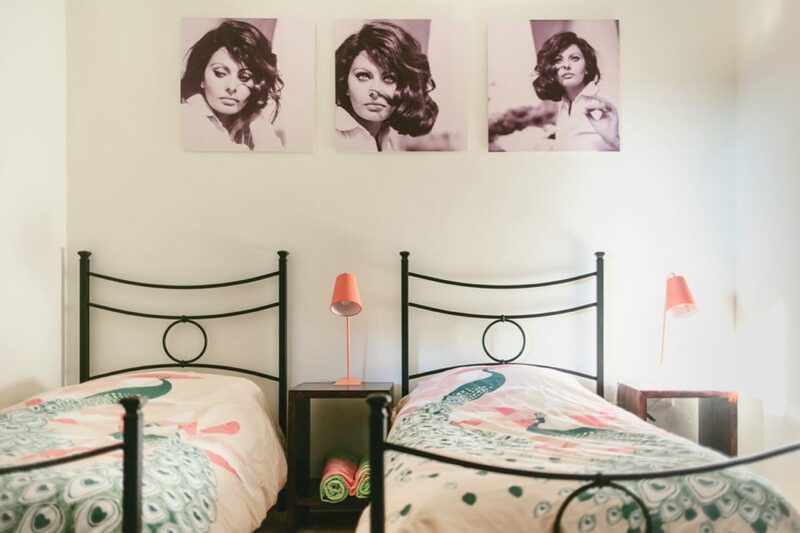 I adapted some pictures (of Sofia Loren and Claudia Cardinale) in photoshop and had them printed. We did do a big renovation. The kitchen is totally redone, in Puglian style. 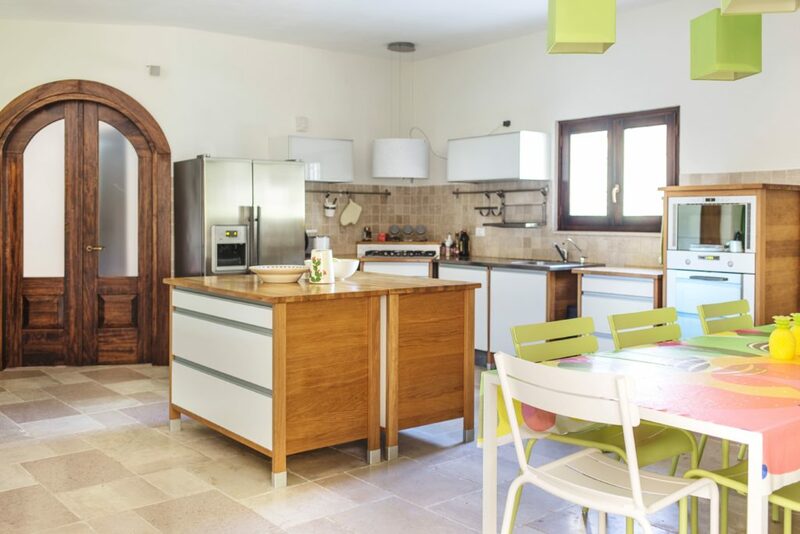 I searched through a lot of books with old Puglian kitchens, and we had the kitchen made by a local carpenter. We are very pleased with the result! For the custom made tiles we also stuck to green and raspberry pink. 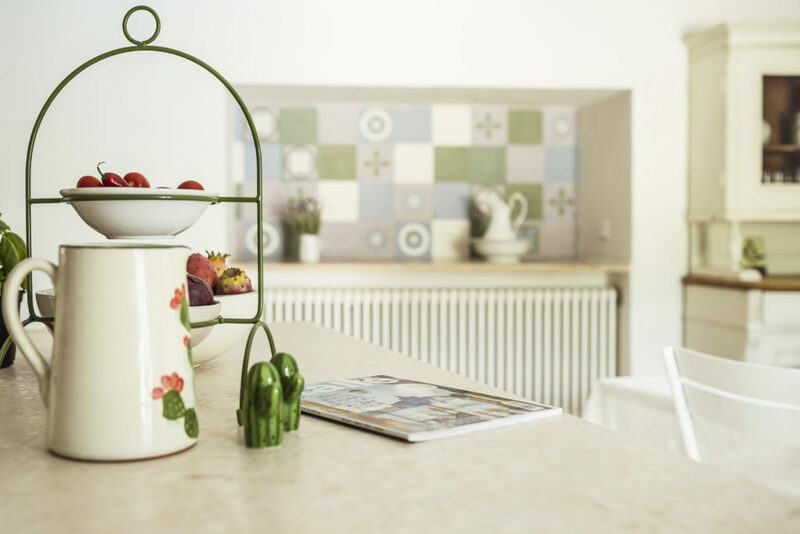 The countertop is from pietra di Trani, a local stone. 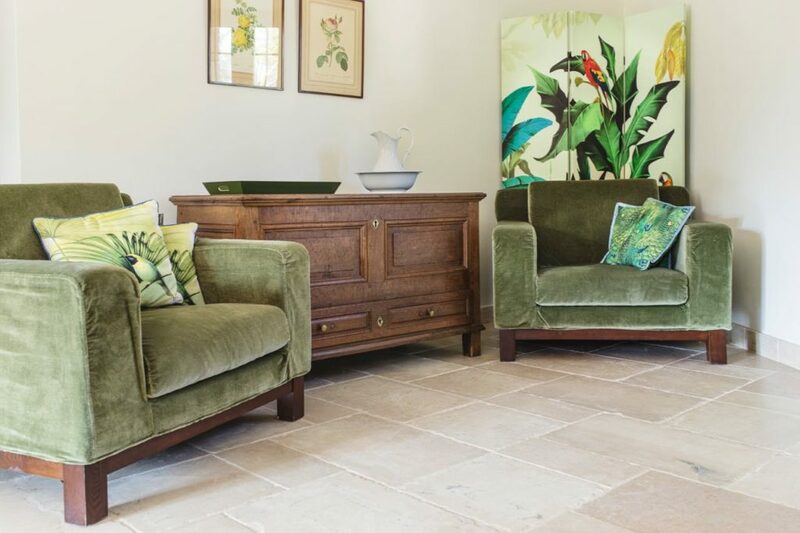 The floor was also made from the same stone. 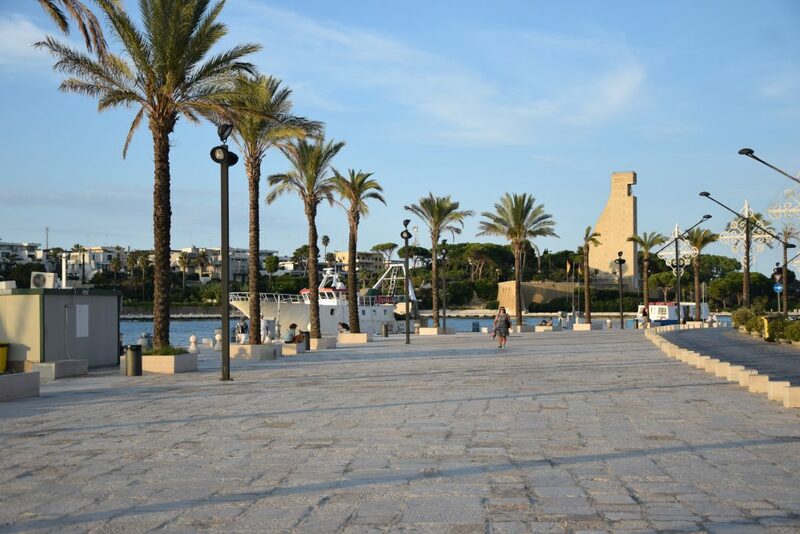 By the way, Trani is a beautiful town a little further north in Puglia. Here you see the pictures I redesigned. And the old dark side tables I repainted white. 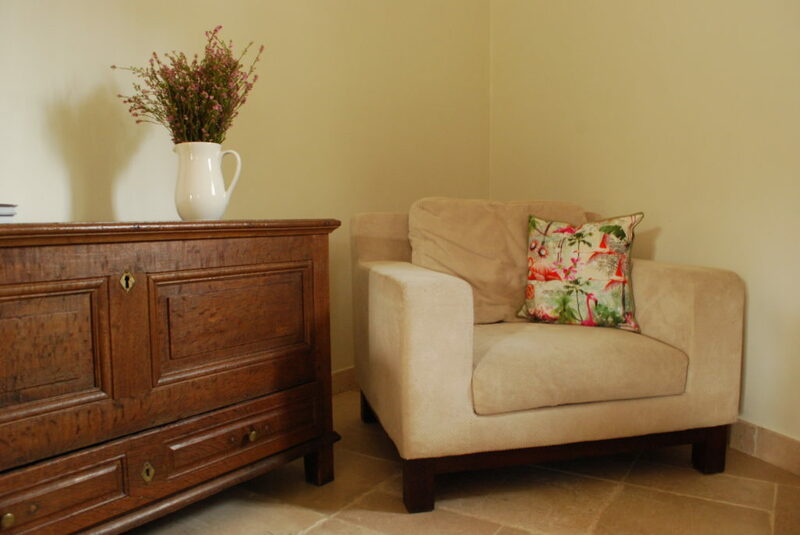 In each room I have a Fermob chair to put some clothing on. I want to use these chairs for the outdoor table now. 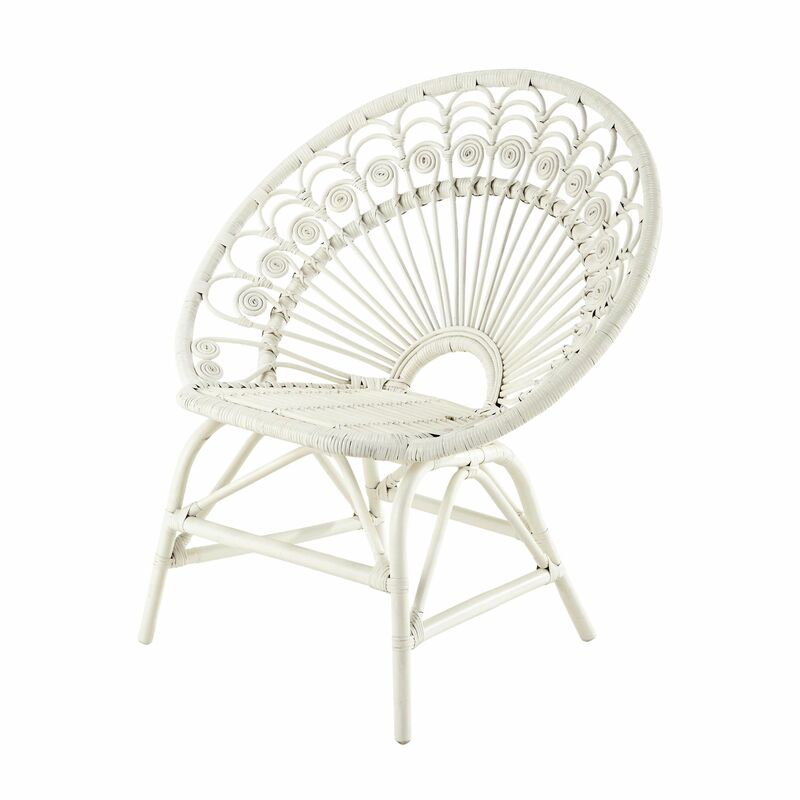 What do you think of these rattan ones instead? Other suggestions? Let me know! On the left, you also see an old closet and a little mirror from my parents home. 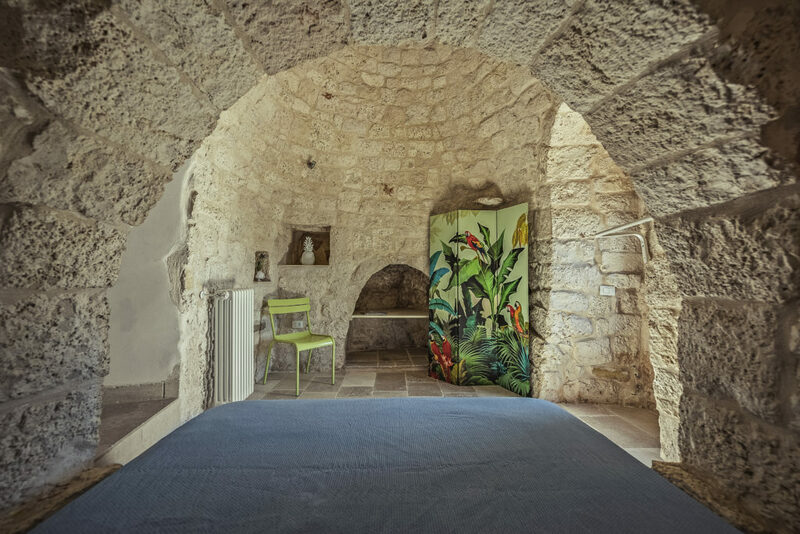 And you can see that this trullo room is made on the rocks of Puglian ground. Did you celebrate well? I wish you all the best for 2019! We went to Casa Vita for a few days, together with a couple of friends. The weather was so-so: two beautiful days, one terrible with hail and heavy rain, and one a bit cloudy. What did we do? 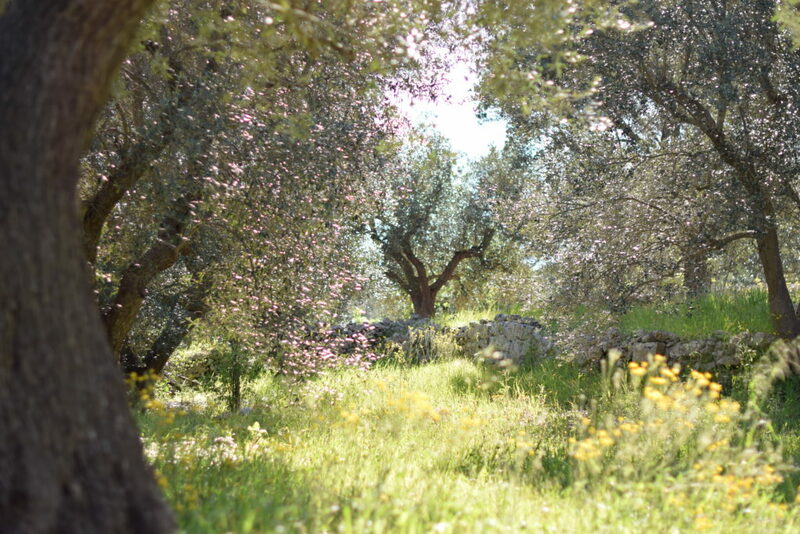 Enjoy the delights of Puglia. The house was nice and warm (thanks to our caretakers!) when we arrived in the afternoon. We had a late lunch and relaxed a bit. 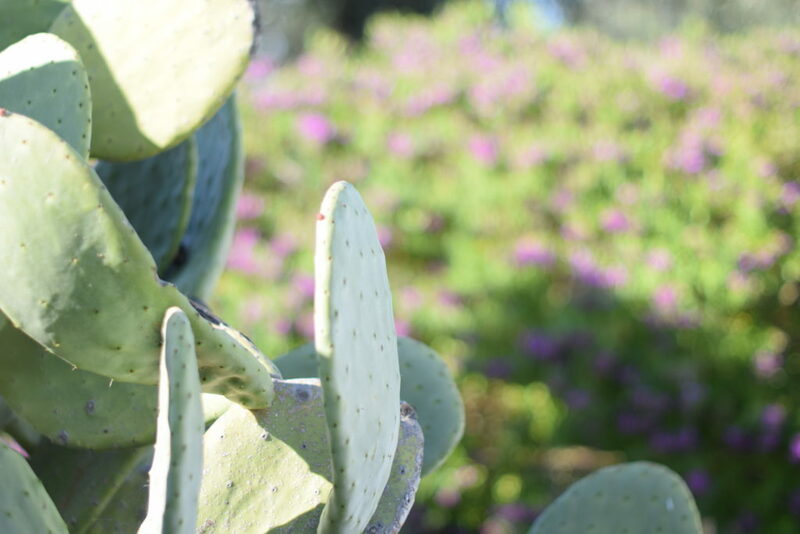 In the early evening we drove to Borgo Egnazia, just a twenty minute drive from Casa Vita and one of the most magical hotels in the South. It was beautifully lit from the outside, and magically decorated in the inside. We tasted a cocktail with live music. Dinner we enjoyed at Il Punto in Torre Canne: fresh fish – era deliciosa! – while we could hear the waves hitting the rocks just outside the restaurant. 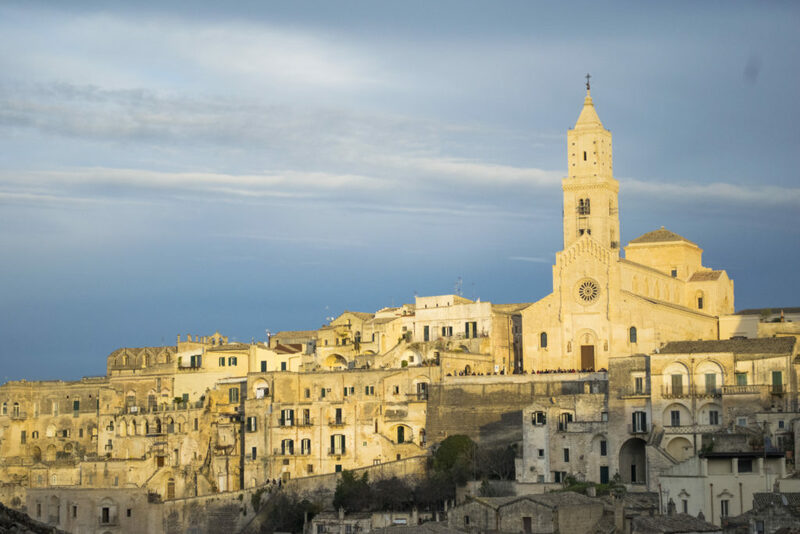 Matera is the cultural capital of Europe in 2019 and our friends hadn’t been there yet. 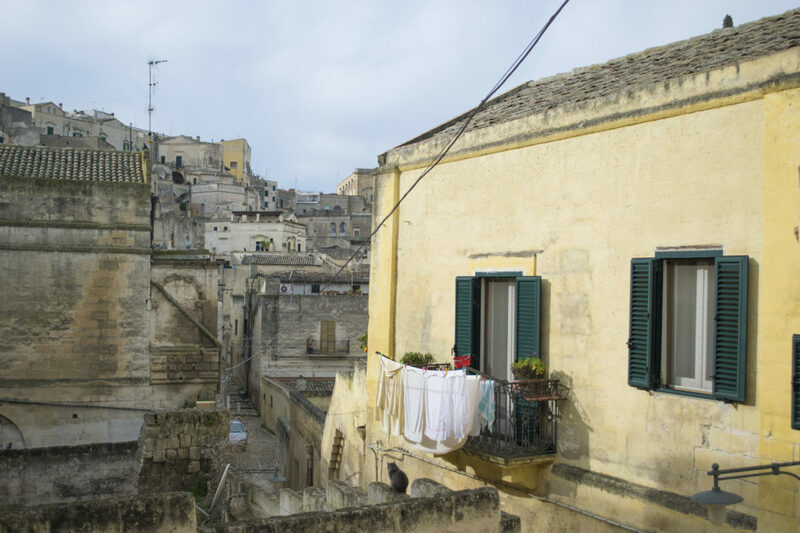 I have written two posts on Matera already: An old city with old friends, and Winter in Puglia. So I am just going to spoil you with some pictures. 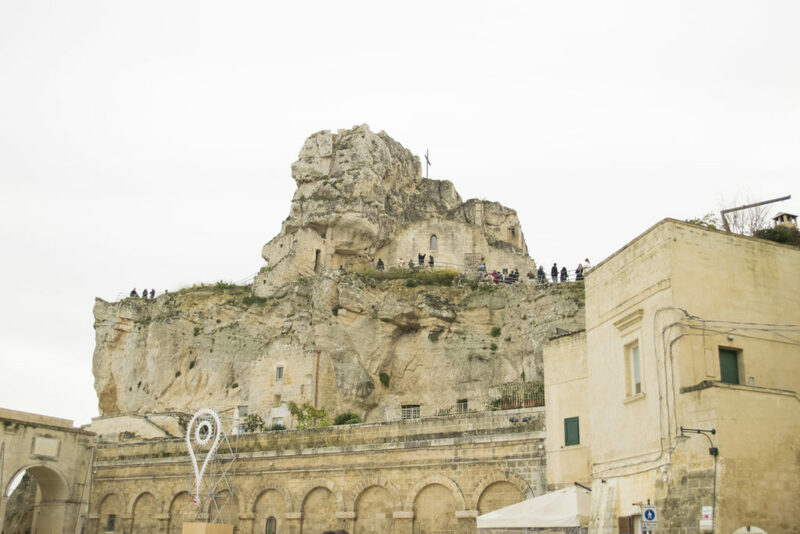 Are you intrigued by Matera? 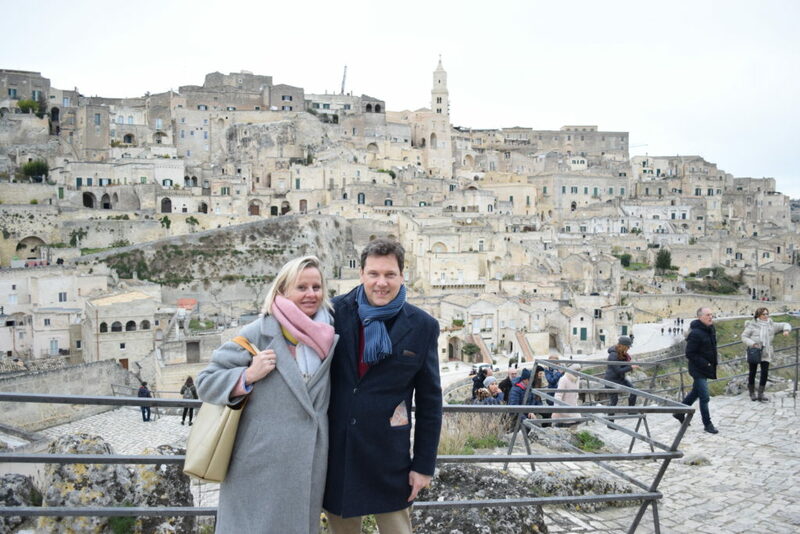 Italy unpacked also paid a visit to Matera. Watch the movie if you have the time! On New Year’s Eve we tried a new restaurant: Mehta! 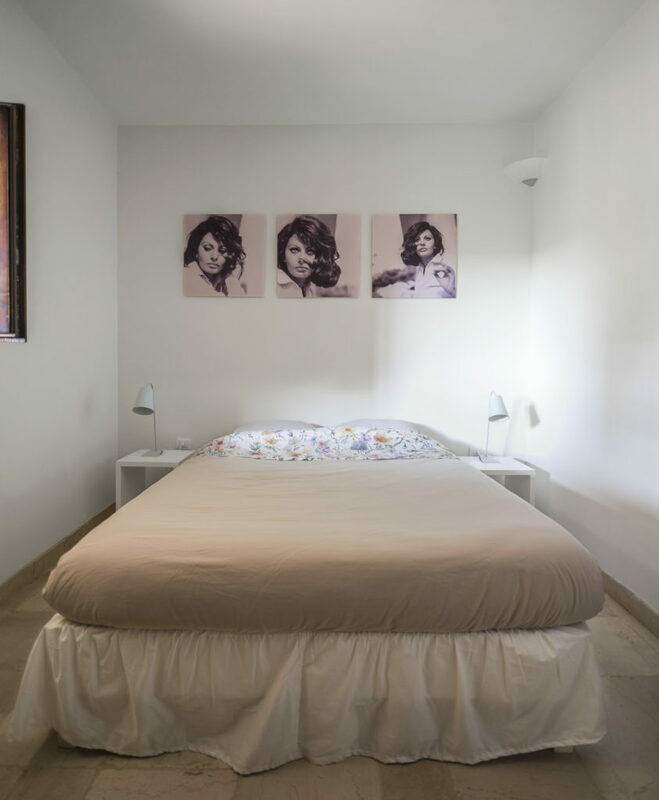 A great choice, it is located in Martina Franca, a beautiful town, half an hour drive from Casa Vita. The menu was a bit too much (certainly the main dish), but the young cook was so enthusiastic and eager to get everything right, we surely want to return. And the new year started bright. 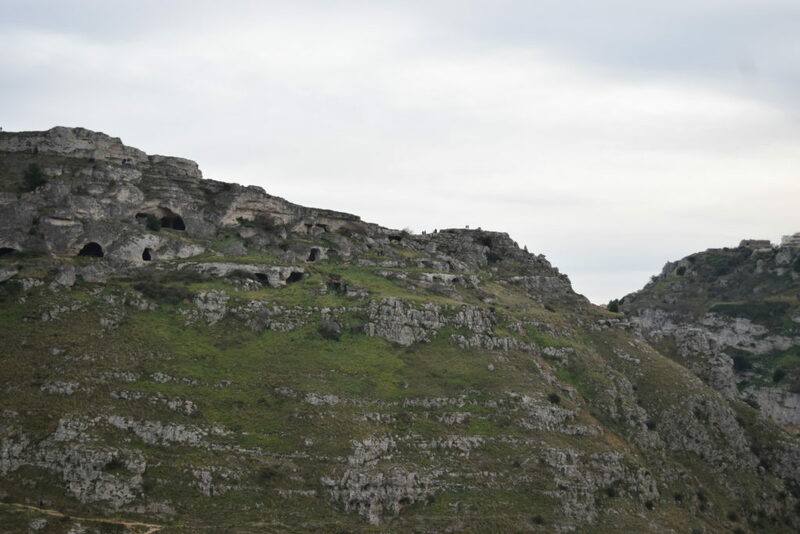 We still had some time to go to Ceglie Messapica, just a ten minute drive. I really adore the main square. All men (old and young) gather around the Clock Tower, women stroll in between, dressed up as if they are going to a party each time. In summer, children play here till midnight. This day it was a little calmer. We could enjoy the view, while sipping our cappuccinos outside, and have a chat with the very funny (it would have been impolite to have taken his photo) Fruttivendolo (fruit seller). Here you see his Ape (three wheel car). How are you? How important is food to you? I admit that it is pretty important to me. When we bought Casa Vita, I envisioned a big table with all our kids and their partners, and lots of delicious Italian food. Honestly, I cannot name one Italian dish I do not like – a disaster for my weight yes, but not for my mood! 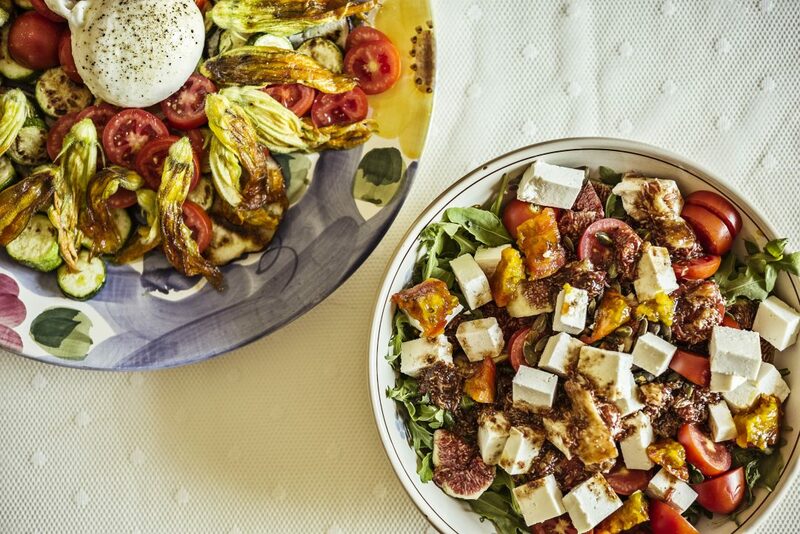 The photo on top is my own homemade food: a salad with arugula, fresh figs from the yard, lettuce, small tomatoes, ricotta cubes and a dressing with olive oil, balsamic vinegar and crushed figs. The other plate has grilled veggies: zucchini, zucchini flowers, eggplant and fresh mozzarella. Photo by Mable Photography. Guests traveling to Casa Vita often ask me for recommendations for good restaurants. 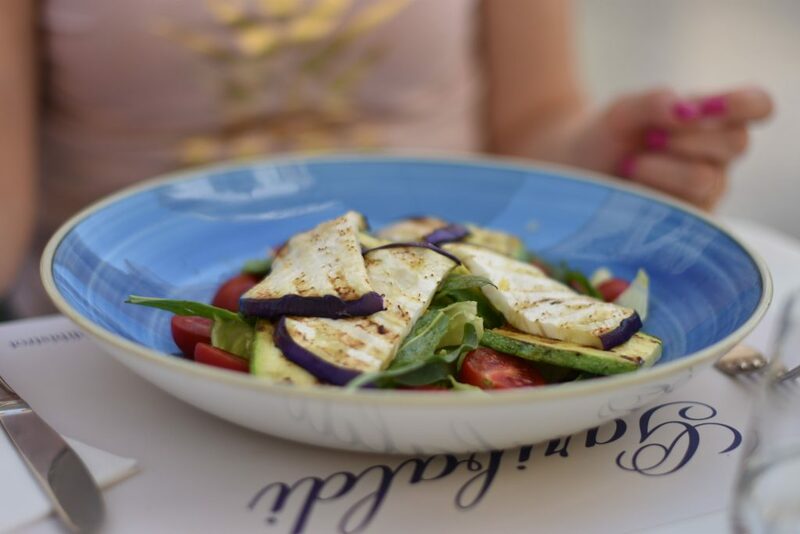 So I will make up a list below, but you should not refrain from discovering new restaurants … There is so much good food in Puglia. 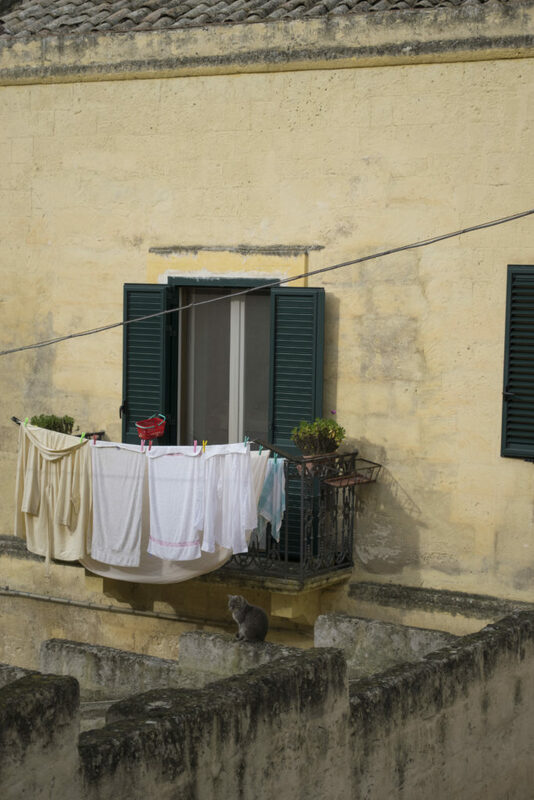 If you are visiting a town, try to wander of the main paths and piazzas and find your way into the smaller alleys. 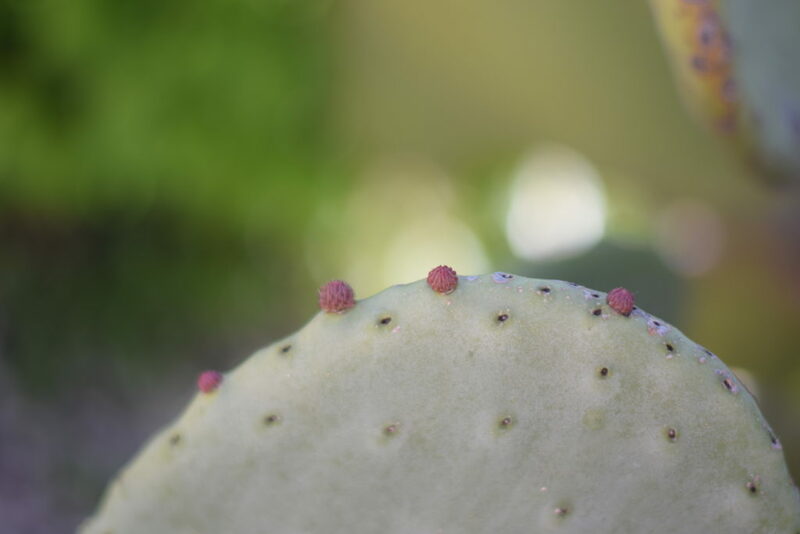 Who knows what you will discover. 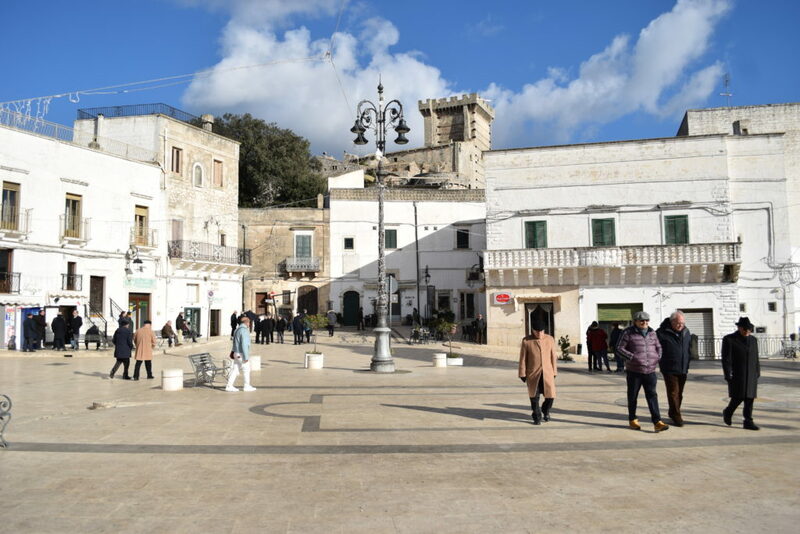 Carovigno is a small but lovely town near Ostuni, with a beautiful piazza. Osteria gia sotto l’arco: this is a restaurant we can certainly recommend, a magical ‘gastronomia’ mingled with tradition and creativity! 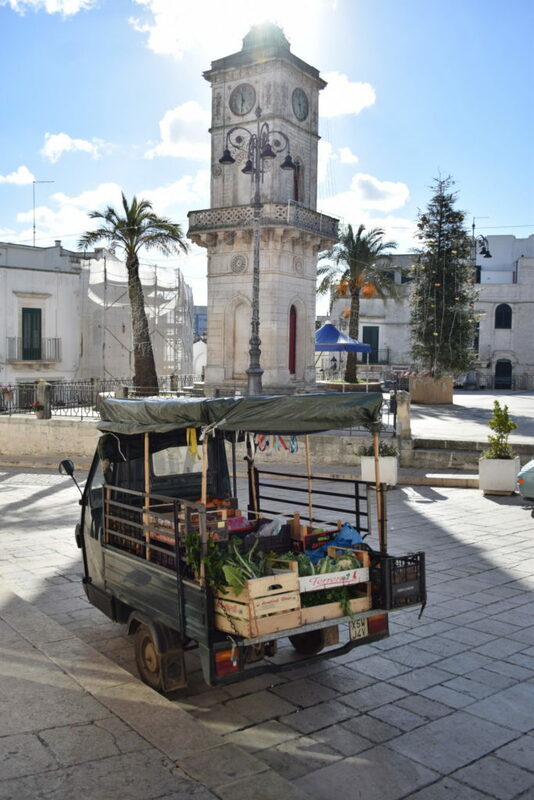 Martina Franca is a fair-sized town in the heart of Puglia. 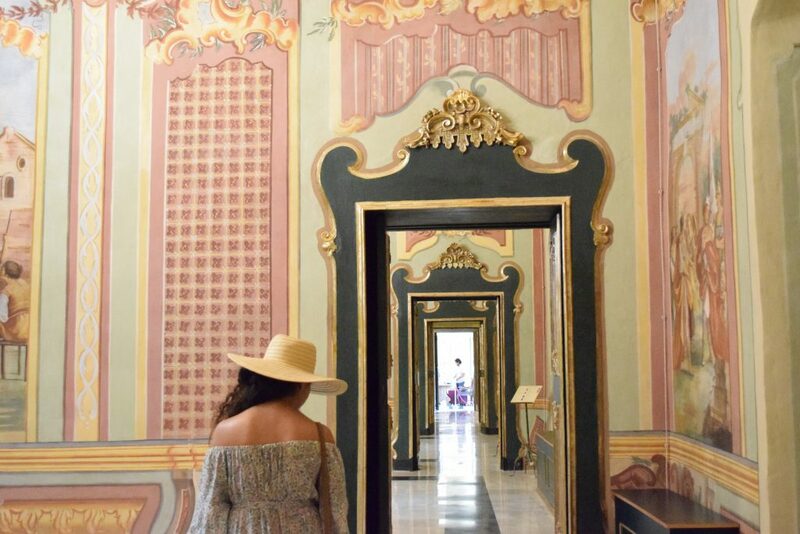 It has some ugly modern areas, but the town’s jewel is its lovely historic center, a memorable maze of winding alleys, where whitewashed simplicity sits side by side with baroque extravagance. 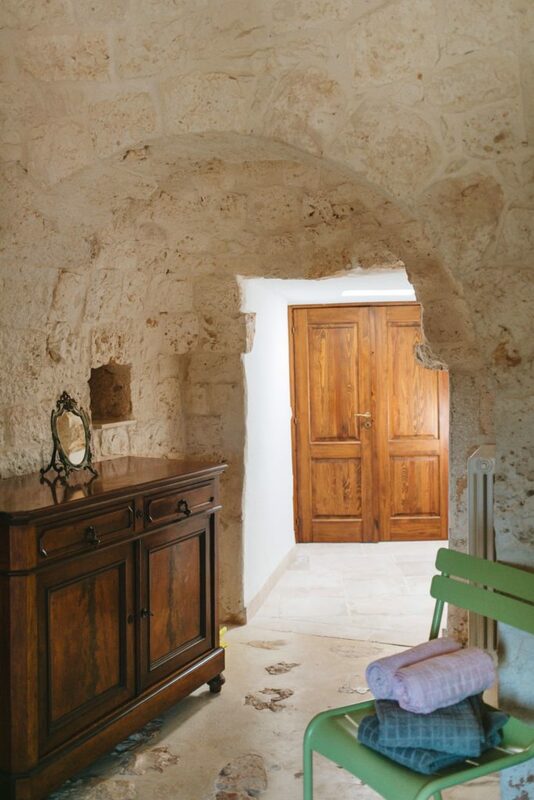 The town is built on a hill in the green Valle d’Itria, the trulli area of Puglia. 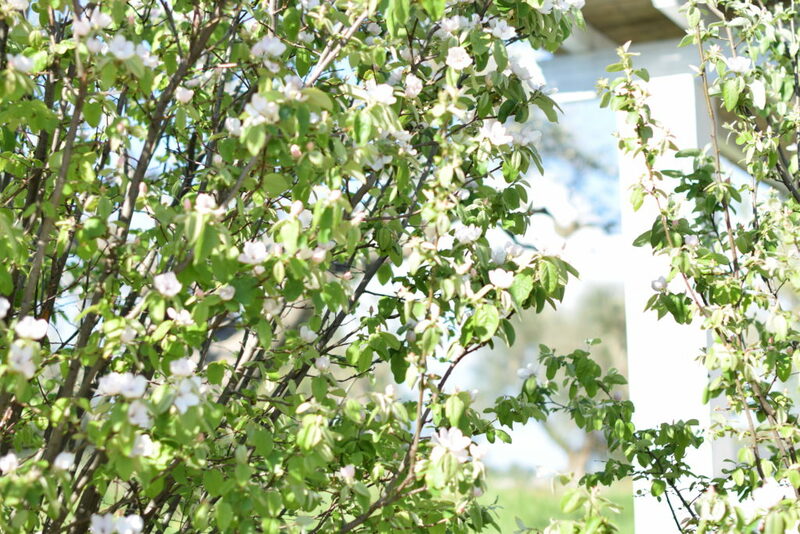 It is about a twenty minute drive from Casa Vita. 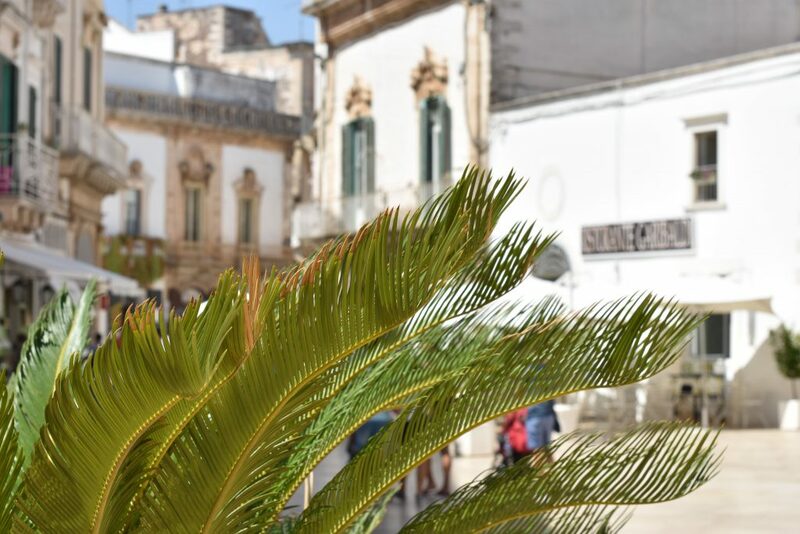 Martina Franca is an incredibly photogenic town, and it has some beautiful clothing stores too. 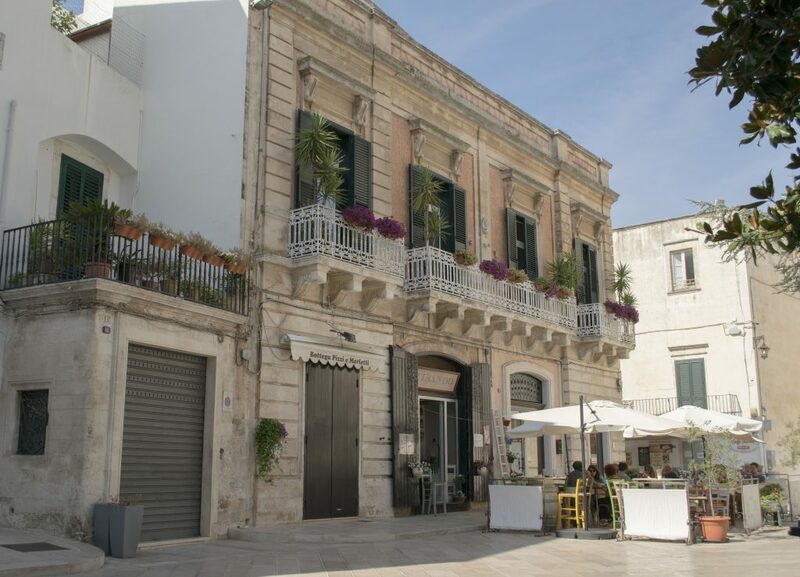 Garibaldi bistrot: beautiful location, near the Cathedral, pure and good Puglian food, delicious wines, friendly owners. 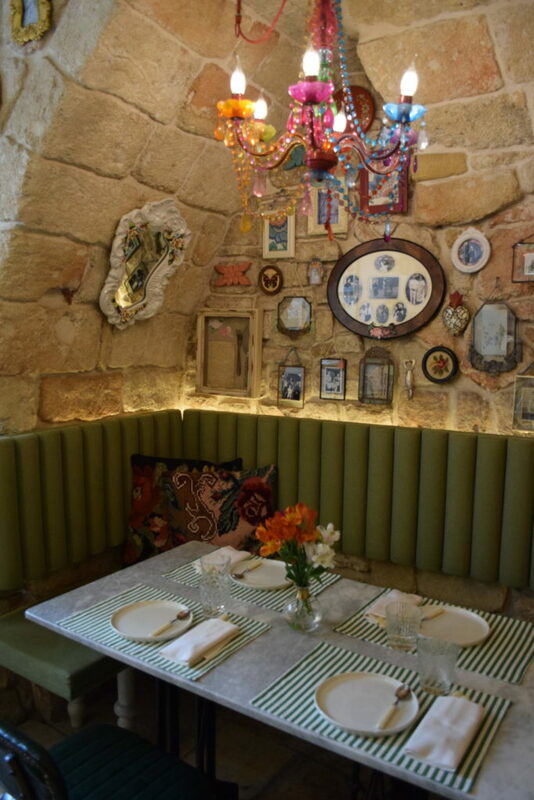 I templari: delicious food, not in the center, but it has a really nice terrace, and also the inside is beautiful. Mehta: I haven’t been there myself. But my friend Susan recommended it. It is high-end cooking, and the desserts are fabulous. I will surely visit next time and will keep you posted! Terra Terra: This is a smaller and cheaper restaurant located in one of the small alleys. The food is also very good, and they serve vegan dishes too. Nausicaa: Also a top restaurant, with a big collection of wines. 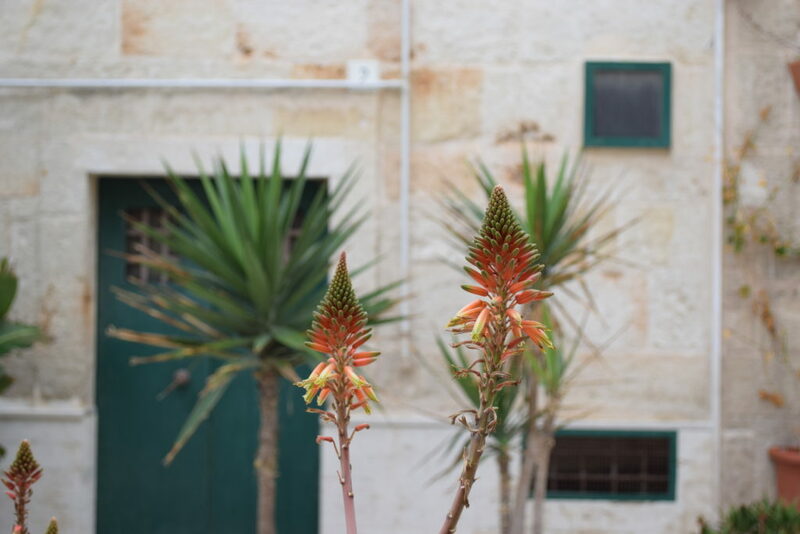 Casa Vita is officially located in Ostuni, but in fact, in distance it is between the two beautiful towns, Ostuni ànd Ceglie. 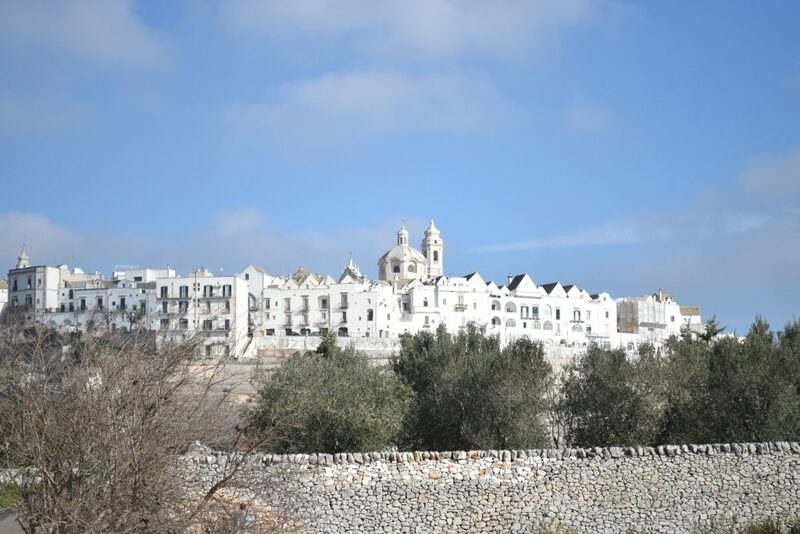 Ostuni is called la città bianca, it is a white town on a hill. 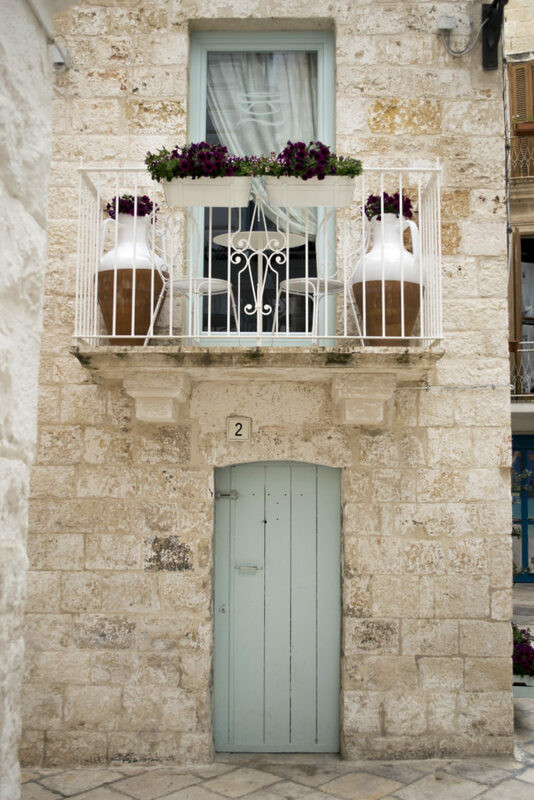 I cannot visit Ostuni enough, it has so many beautiful alleys, piazzas, stairways… Each time you discover something new. If you find your way (it took me some time to figure out how to get to a certain restaurant) to the top, you’ll be rewarded with a beautiful view on the sea. Bella Vista: a nice view, if you are sitting outside at the right spot, you can see the sea. They have great pizzas and antipasti! Taverna della gelosia: it is located between different street levels, beautiful to sit outdoors on the patio, under the trees. The food is delicious and a good choice of wines too. The staff can be a bit stiff though. 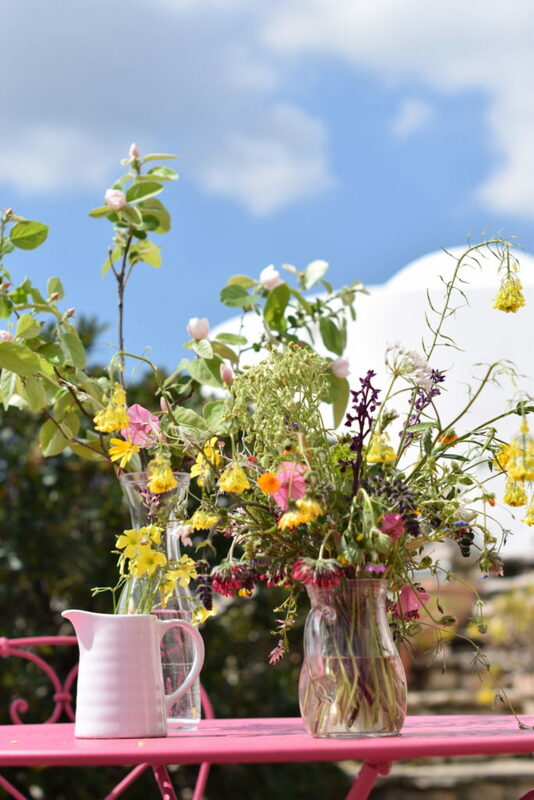 Il Cielo: this is located in a hotel and has a Michelin Star. Also on our list, must be worth a visit! 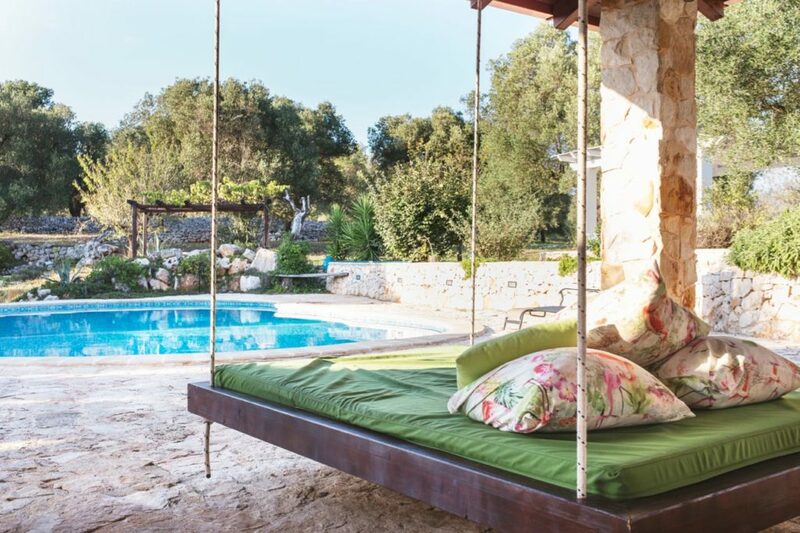 Casa Vita is situated between Ceglie and Ostuni. 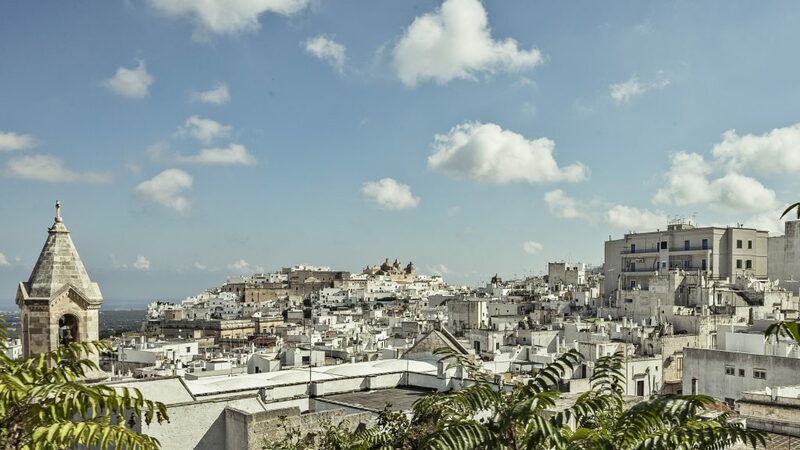 Ostuni is beautiful and magical, but also touristic. 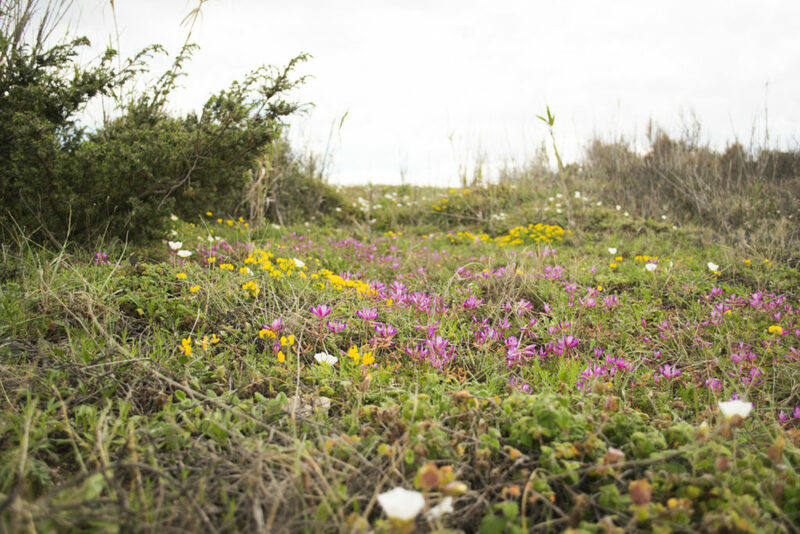 While Ceglie is more of a hidden treasure. It’s not as big as Ostuni, but here you find more local people. I love the piazza with the bell tower. You can sit here all evening, watching the men hang around in groups, the elderly men with three on a bench, families gathering, kids playing on the square till midnight. 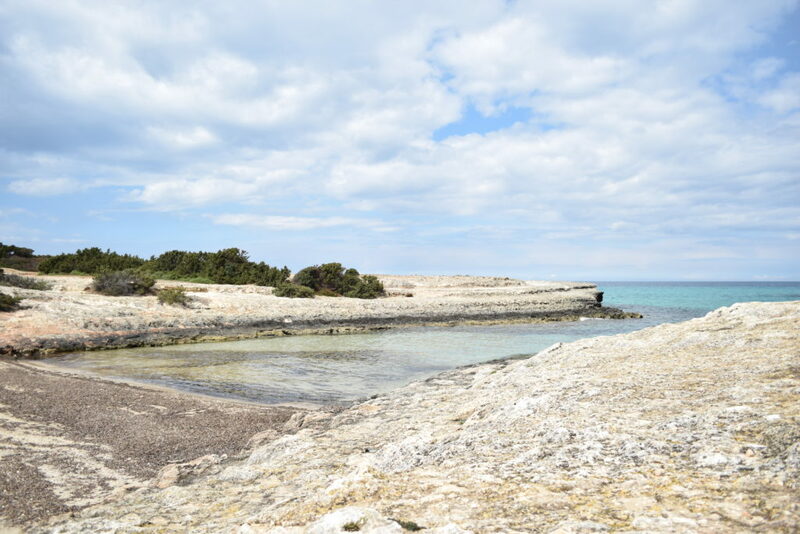 This is still the real Puglia. And you can eat very well for less money than in Ostuni. 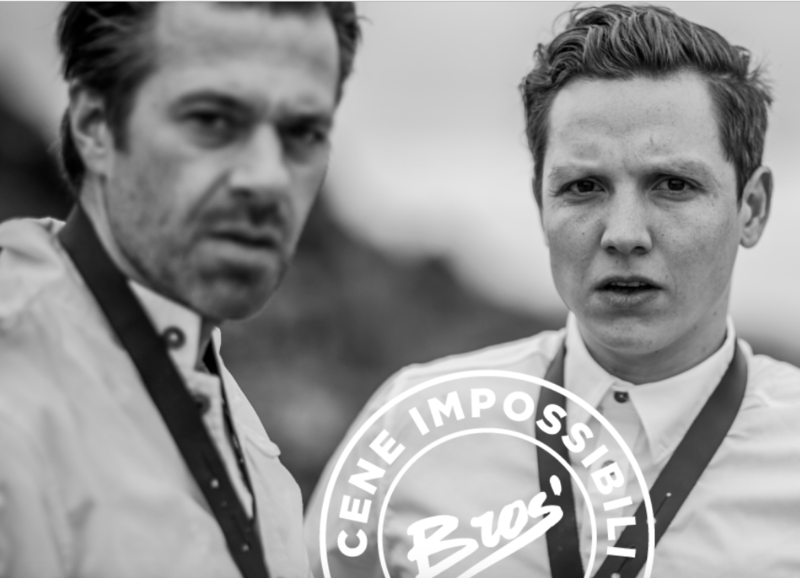 Cibus: a great restaurant, but more meat-orientated. The antipasti we got there were sublime, really delicious. Osteria Pugliese: very typical food. You’ll have enough if you order the antipasti della casa. It is very cozy inside. Pizzeria Grex Ludi: it is the only pizzeria on the main piazza – the piazza with the bell tower. You can eat great pizzas for three or four euros! Trattoria Piaceri e Tradizione: just behind the corner of the square. The cook Giuseppe will prepare you a delicious typical meal. And if you can, sit outside on the balcony, and you’ll have a beautiful view. 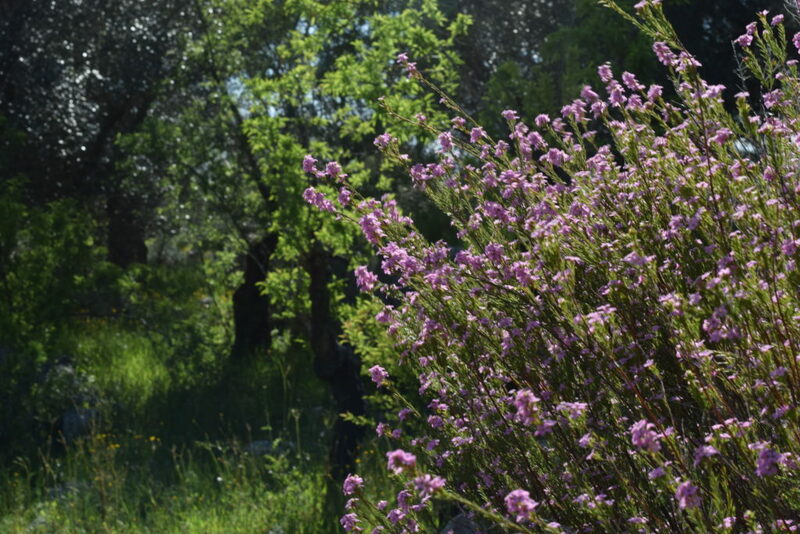 Antimo: this restaurant is not in the town, but in the countryside on your way to Ceglie, when you come from Casa Vita. It is an organic farm. They use a lot of ingredients from their own land. The stuffed (with ricotta) zucchini flowers are delicious. You can also follow cooking courses here. 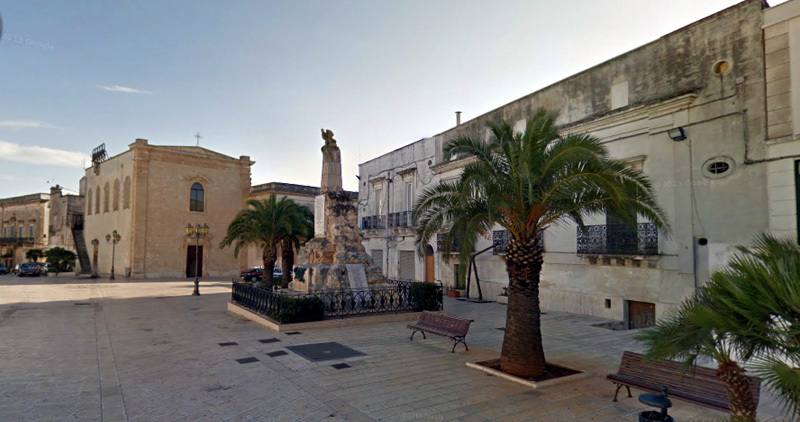 Locorotondo doesn’t really have any specific tourist attractions; the town itself is the main sight. It is also a small town on the top of a hill. 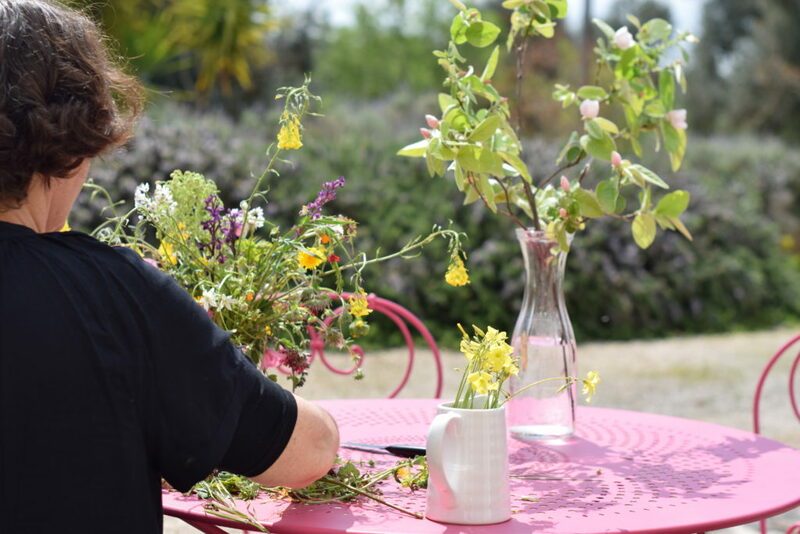 It’s just a pleasant place to spend an hour or two wandering, taking photographs and sitting at cafe tables. U’Curdunn: Great restaurant and very cozy and beautiful inside too. Good service and excellent wines. 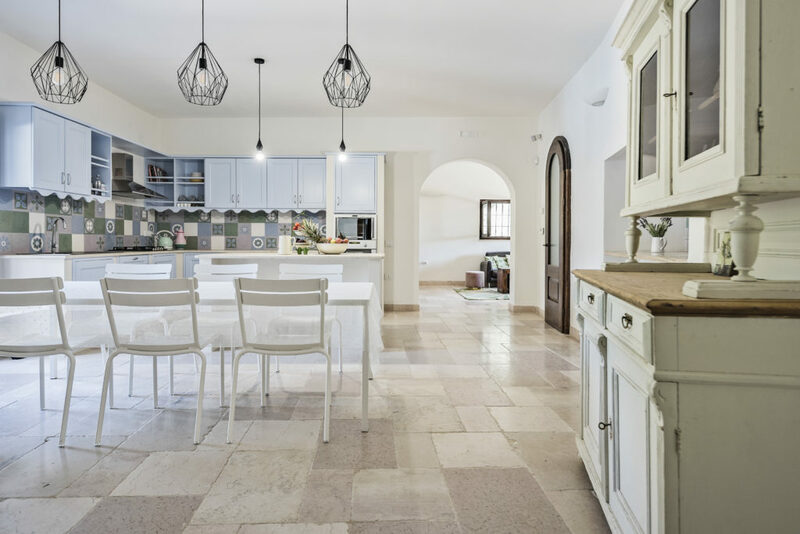 La taverna del Duca: Delicious food, and you can also follow courses ‘how to make your own pasta’! 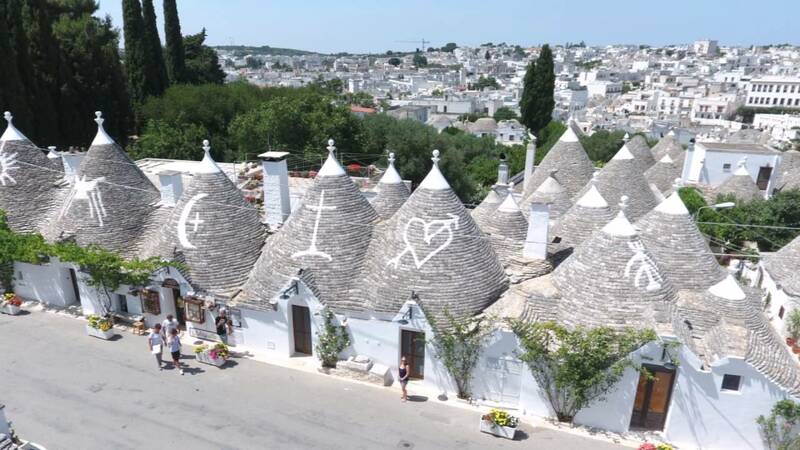 Alberobello is thé trulli-town and Unesco world heritage site. It is also terribly touristic, a visit during the summertime is a challenge. But I can recommend a very good restaurant just outside the center. 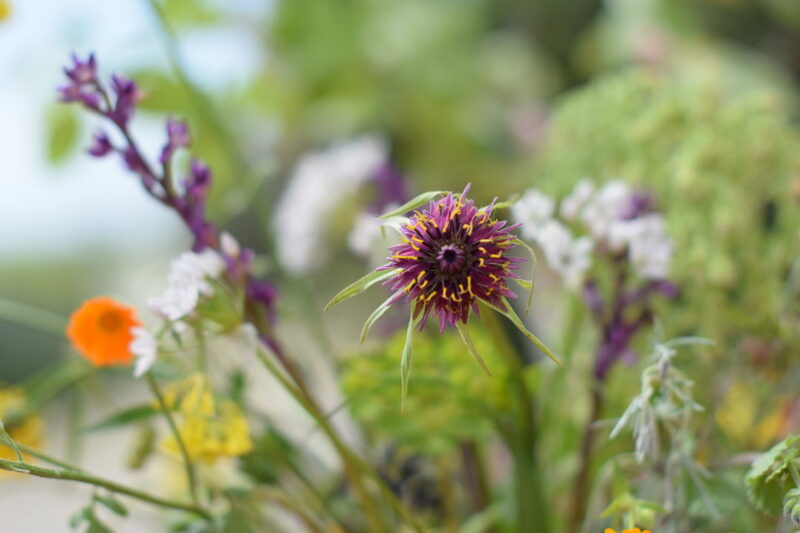 Fidelio: A beautiful garden, magical to sit outside, but very attractive interior too, and exquisite food! 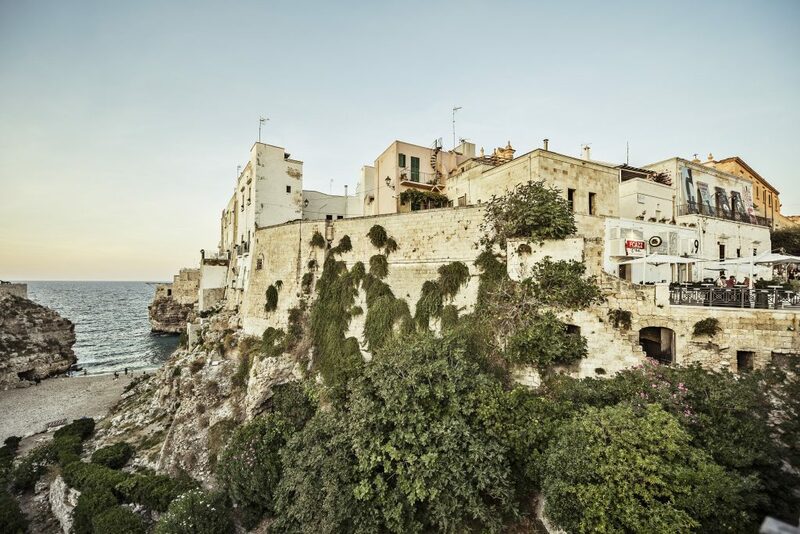 This magical town at the rocky cliffs sure is worth a visit. It has many touristic restaurants (not all with a good price-quality balance), but I want to quote these two. Mint: I have been here with a friend, and Daughter has visited with her boyfriend. Excellent kitchen, vegetarian too. It is such a small but beautiful restaurant! 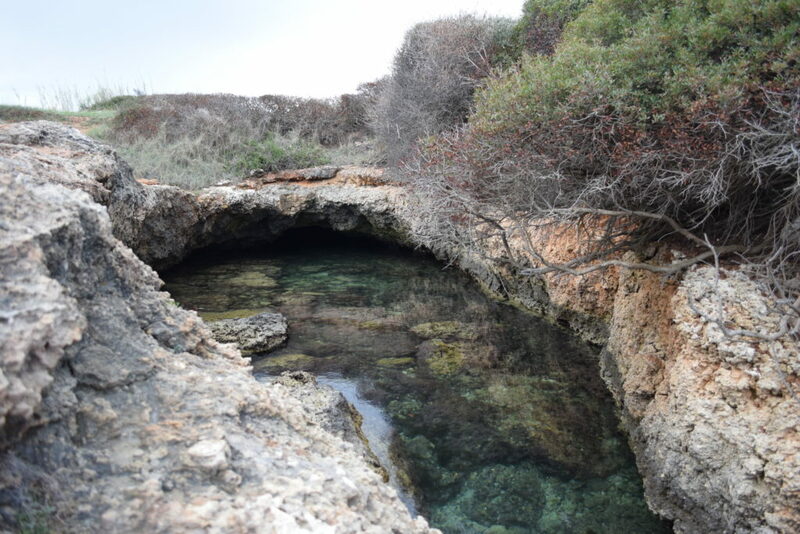 Grotta Palazzese: This is more an experience than a good restaurant. You pay for the view and the experience, because you dine in a cave. Check the site, it is worth going there. But you need to know it is not cheap. Piovono zucchine: I told you all about this excellent vegan restaurant in one of my latest blogposts “Il cibo vegetariano“. 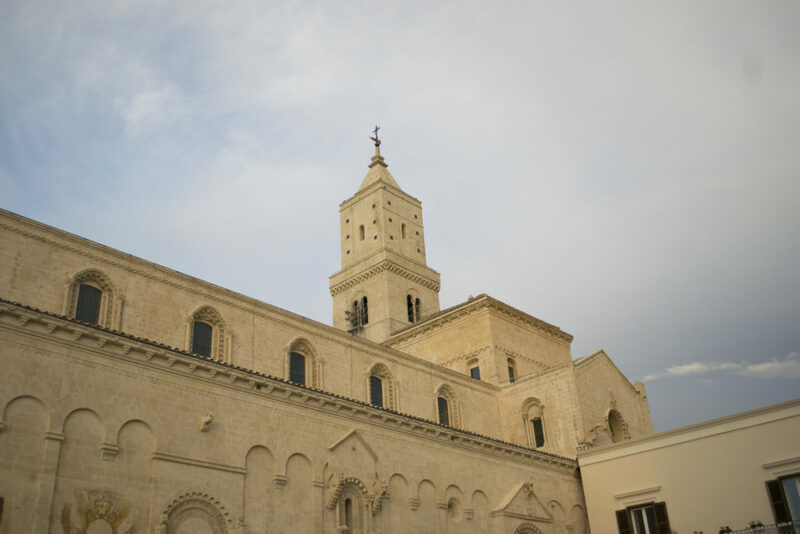 Lecce is one hour drive from Ostuni, and it is often called the Florence of the South. 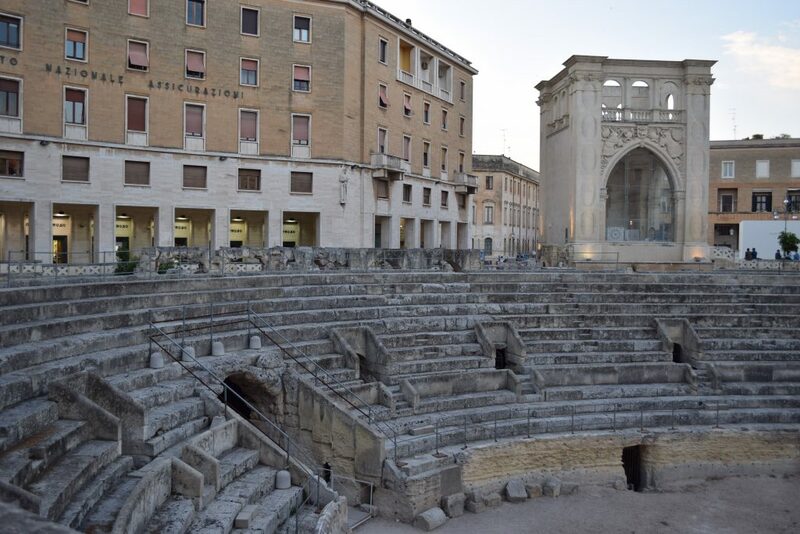 Lecce has a lovely historic center (centro storico), and travelers can easily spend a day or two exploring picturesque little lanes and finding the more far-flung Baroque churches. 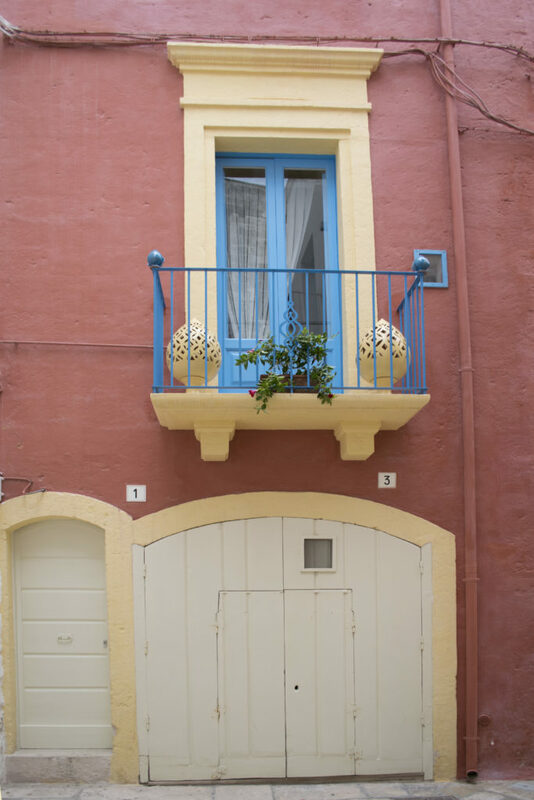 The town’s great artistic treasure is its architecture. Bros’: You wouldn’t think if you see it from outdoors, but this is a superior restaurant. I have had the pleasure to devour their menu, together with my American friends, last year in May. And look who’s been here too! For readers not from Belgium or Holland, this is Sergio, a famous chef de cuisine, who has received three Michelin stars in one of his restaurants. Do you like Picasso’s work? 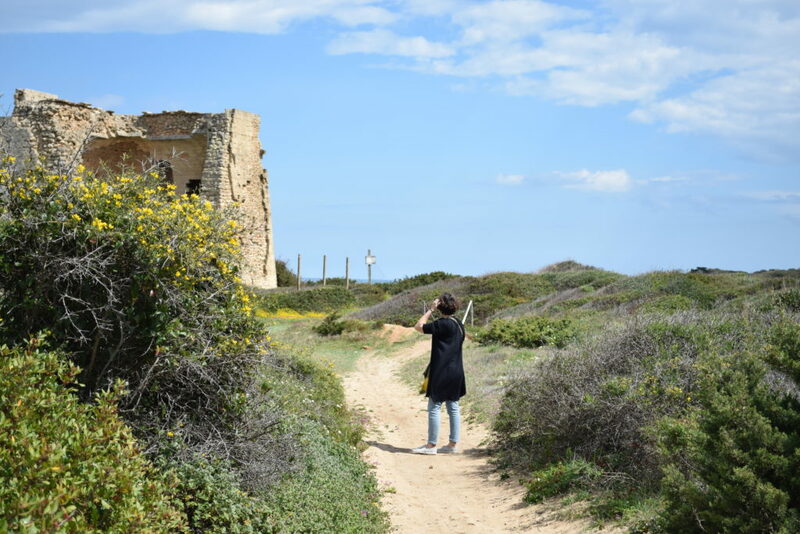 It is quite exceptional to see the work of a Spanish artist here in Puglia. My friend Habiba and I were lucky. 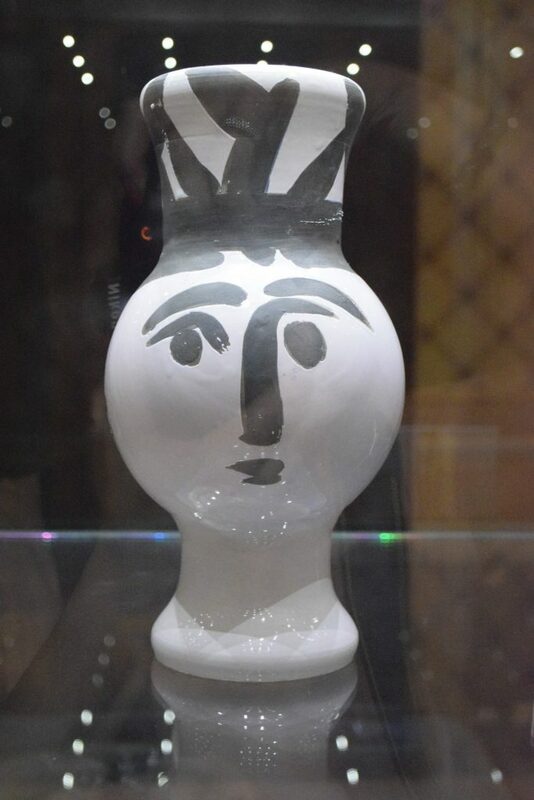 It was a small exhibition though, just roughly thirty pieces of mainly pottery designed by Picasso, from the forties till the nineties. 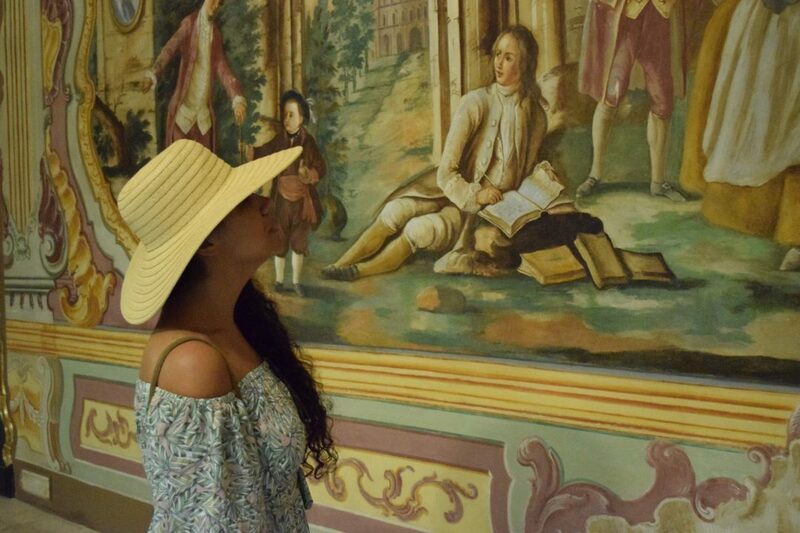 We saw the exhibition “L’altra metà del ciello” in the Palazzo Ducal in Martina Franca. Built in 1668, this was once the palace of the Caracciolo family, the dukes who presided over the town’s glory days. 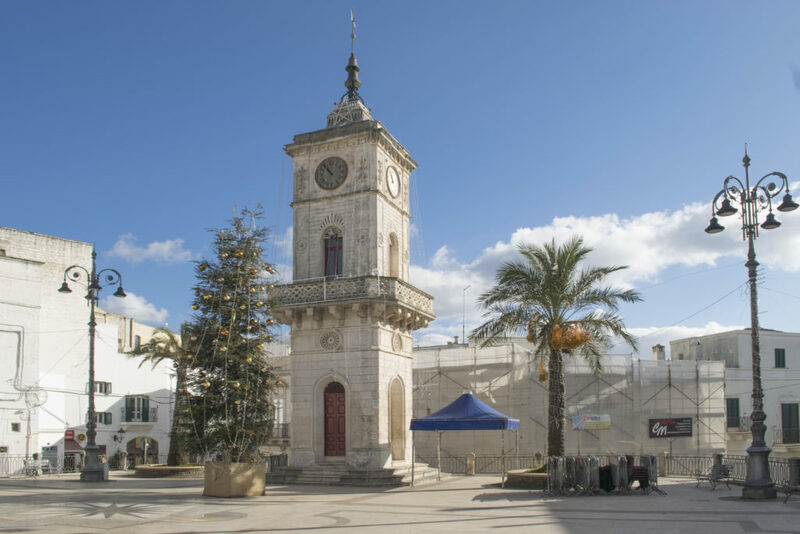 Nowadays it houses the town hall, a library and Martina Franca’s tourist information office. It is beautiful inside, all painted walls with bible stories. 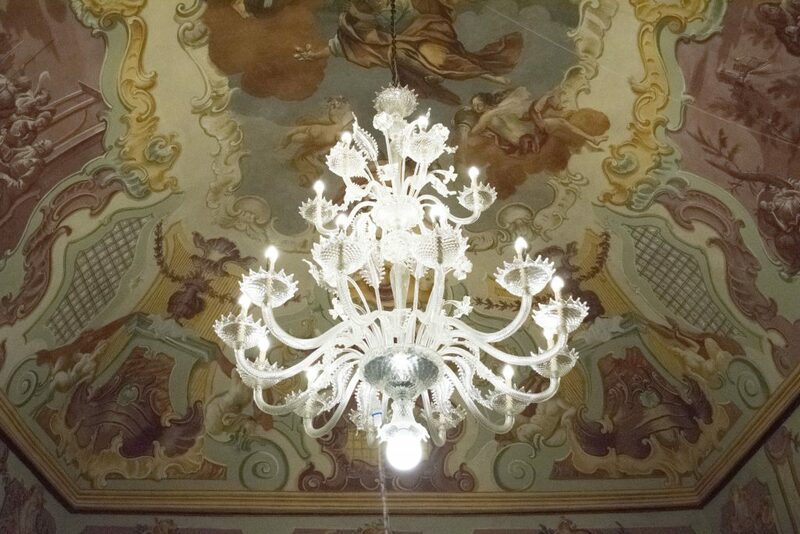 The huge chandeliers gave it an enchanting feeling. Do you know the perfect trick* to get into an exhibition for free? Well, we knew the exhibition would close at 1pm and were a little late. We arrived at the ticket office at 12:30 and the guy behind the counter just announces us that the cash register is closed. The museum was still open till 1 pm and would open again at 3 pm. I already knew from a friend that it was a small exhibition, doable in half an hour. So we couldn’t pay, and therefore couldn’t get in anymore. 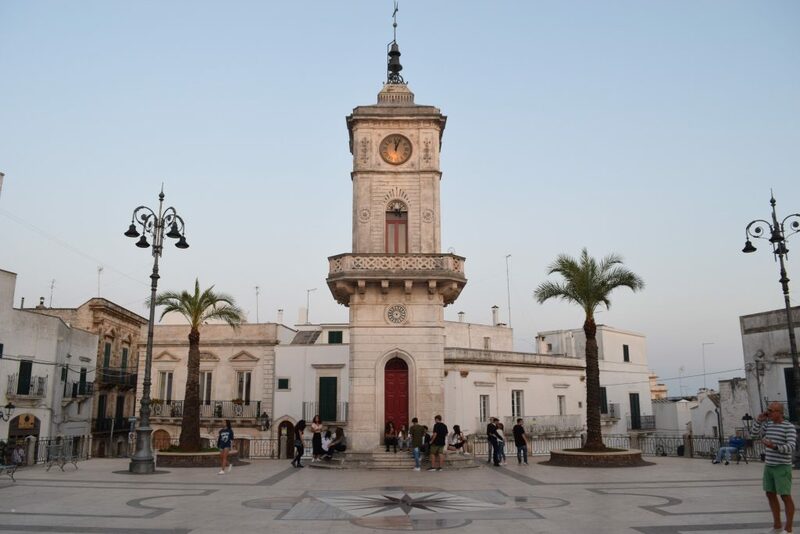 Just before, when we were driving to Martina Franca, Habiba and I had discussed our disapproval of bureaucracy and how people working in public administration offices often misuse their power to counteract their frustration with their job. Faced with bureaucracy in reality now, it was we who got frustrated. I tried my best Italian to tell the guy we were so much looking forward to this visit and that we couldn’t come back in the afternoon. We both switched to our most depressed look on our face and turned back to the entrance. “Aspetta!” he called out to us. He winced and told us to quickly sneak in to the museum, without paying. I guess the guy -let’s call him Matteo- I guess Matteo was frustrated with bureaucracy himself. Mille grazie Matteo, per la tua disobbedienza al sistema! We still had a perfect lunch (a salad) on the piazza Roma, just in front of the Palazzo Ducale. *Don’t try this yourself, Art and Culture needs to be cherished, and can use our support!